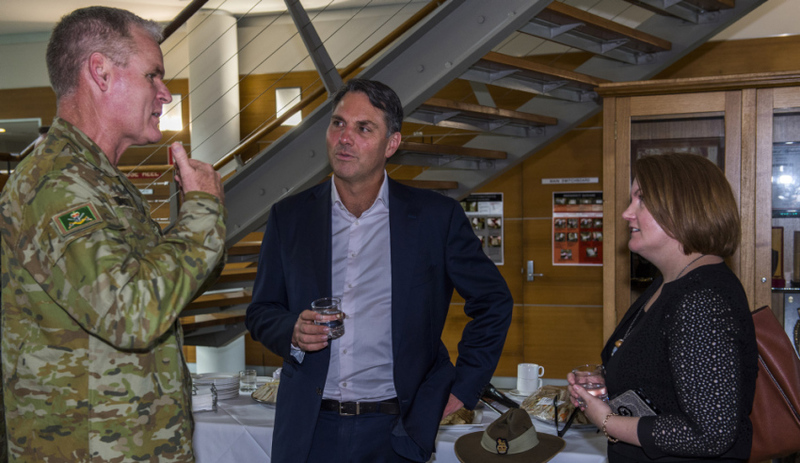 Opposition spokesman for Defence Richard Marles MP with Commander 1st Brigade, Brigadier Ben James. Increased engagement with small and medium sized enterprises (SMEs) has been flagged by the government across various defence policies and documents, most recently the Australian Industry Capability Plan Template, which Minister for Defence Industry Christopher Pyne said will maximise the inclusion of Australian SMEs. Opposition spokesman for defence Richard Marles has echoed these sentiments, calling for better consultation between government and industry. The Labor MP joined Defence Connect for an exclusive podcast where he noted the conflicting nature of government and SMEs as problematic to increasing engagement. "From the government perspective, governments are big animals. Dealing with small, medium enterprises doesn't come naturally. That's been the case across governments of all persuasions," said Marles. The Victorian MP said developing this engagement is not only beneficial for the SMEs, but also crucial to developing a strong defence export industry. "I really think that we do need to be working, though, on ways in which we can better engage small and medium enterprises. Because a lot of the opportunities to become [an] export-based business actually lie in that sector," Marles said. "It is smaller companies with, perhaps, a piece of technology that's been developed in a certain way, which may well be world-leading. We need to be giving those companies the opportunity to participate. It may well be doing work for the Australian Defence Force, initially, which gives them the break they need to walk onto the global stage." And while high-tech has been touted as a key way to develop and expand the defence industry, Marles said this is not the only way to increase work in this sector. "But also, you can take this to another level, as well," he said. "Not necessarily in the high-tech space, but just providing work to bases around Australia. There's a lot of ... In Darwin, for example, or Townsville, very much defence-focused towns, where there's a whole lot of companies there that could be providing all sorts of services to the Australian Defence Force. They don't necessarily need to be high-tech, but there's the capability in those cities to do that. "I think ways in which we can engage local companies like that need to be explored, because certainly there is a sense that they miss out." To hear more from the opposition spokesman for defence, tune in to our podcast here.